Change your body, and your life, with our Personal Training app. No matter where you are, you can have your unique Personal Training plan delivered through our bespoke app. Your workouts are laid out step by step, with videos, instructions and feedback - all you have to do is turn up and hit START. Because it's personal, your plan can be adapted to your location, equipment, time and goals. Training is a game of numbers, and I take the guess work out. I'll help you define ambitious but attainable goals, and build the right program to get you there. Every step is measured, so you can see clearly what's working for you. Whether your focus is on strength, weight, body fat, mobility - I can deliver the program to get you results - guaranteed. This is true Personal Training. You have your own unique program, targeting your specific goals. 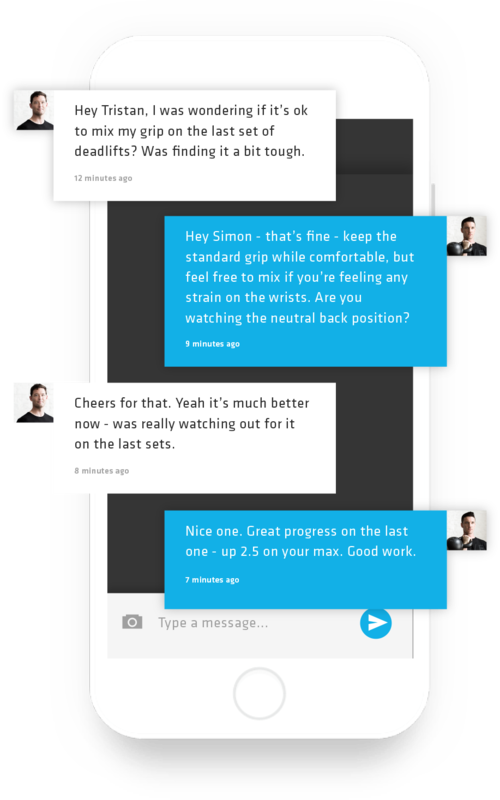 You coach is on hand to give feedback or answer any questions as you work through it. There's no grey area here - you have support when you need it, and a plan that's always a step ahead.